We haven’t met many of you, but we’ve been admiring you from afar. You make the web so beautiful and easy to use. You light up the room when you come in to our restaurants, visit our butcher shops and stop by our stands at the farmers market. But we haven’t had a chance to reach out – until now. 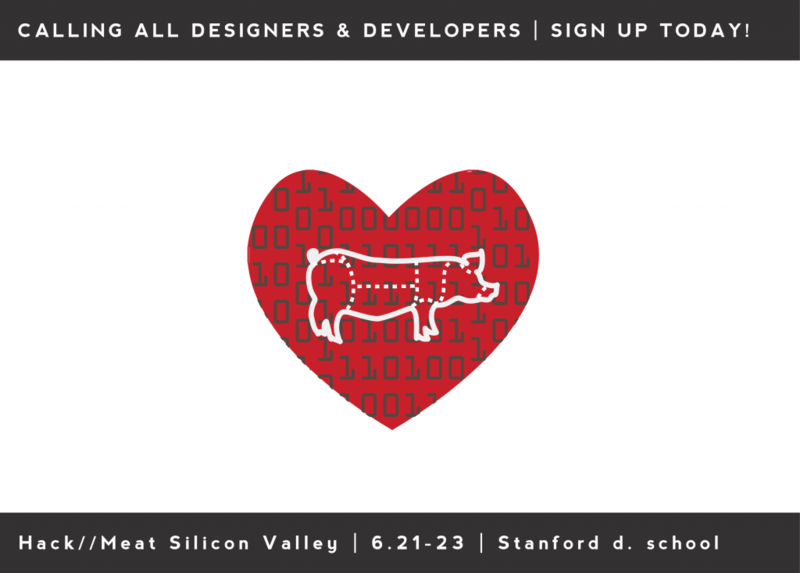 You see, we’re hoping you’ll join us for Hack//Meat Silicon Valley, a weekend of learning, building and feasting that we promise you’ll never forget. We will tackle all kinds of meaty issues – like data management and consumer education- and we want to work with the best and brightest minds, like you, to prototype software and hardware solutions to these challenges. Don’t worry, we don’t expect you to to have prior knowledge of these issues; after all we don’t know how to code or design. Our friends at The Design Gym and the FEED Collaborative will be on hand to help us break down the issues and ideate new solutions. We know that if we work together, we can start prototyping a tastier, more sustainable future of food for all. Demo your prototypes to our expert judges, including Michiel Bakker of Google’s Global Food Services, Bill and Nicolette Niman of Niman Ranch & BN Ranch, Nico Hrdy of Valley Oak Investments, Amol Deshpande of Kleiner Perkins, Chris Cosentino of Incanto and Anya Fernald of Belcampo Meat Co. Enjoy incredible sustainable food and drink all weekend long. So, dear designers and developers, we hope you’ll accept our invitation and register here.